With it being Xmas Eve I wasn’t going to fish but the thought of going nearly two weeks without my fishing fix didn’t really appeal. If possible I wanted to stay local but I knew Ilminster didn’t have anything on so I text Les who said they were going out Perry St and I could fish, perfect. 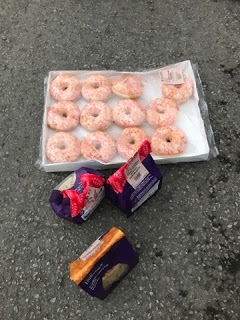 Of course it didn’t take long for my arch nemesis, The Torquay Tart, to get wind I was fishing and I soon received a text saying not to forget to bring a pound for him, on the plus side he said Smithy was also fishing and bringing cakes! We met at Wetherspoons and I have to say I really enjoyed the breakfast, lots of it and coffee for less than a fiver, great value. 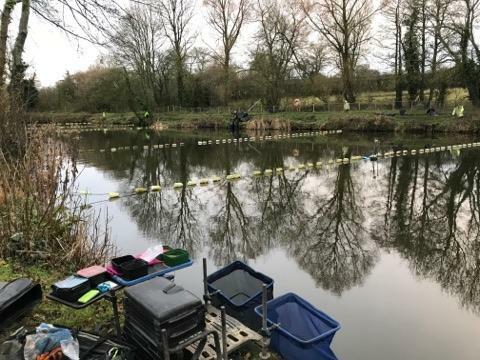 It was great to see everyone and to be honest, as I haven’t fished it since the summer, I didn’t have a clue what would be a good peg this time of year. Everybody was saying 19 would be hard to beat today and also peg 10 had won the last match but once again my drawing arm had deserted me when I opened my peg and saw number 14 staring back at me. To be fair it’s normally a pretty good peg so I wasn’t too upset. 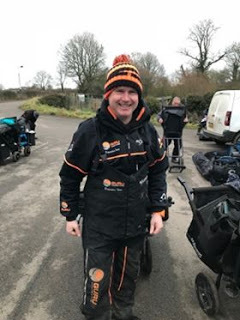 Hoff was the lucky angler to pull out 19 and the Tart was looking very pleased with himself as he’d drawn peg 4 with three empty pegs to his right and one to his left! Les and Commander Smith were the two anglers on corner pegs 10 and 11 and my neighbours for the day were Bushy on 16 and Mark on 13. The Tart asked if I wanted to enter their van sweep so I stuck my quid in the hat. We got to our pegs and the pond was very clear although there was the odd small fish topping which I hoped was a good sign. 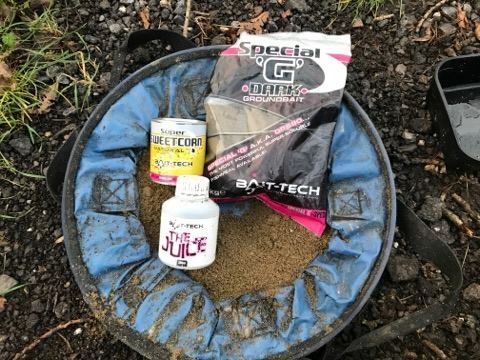 I set up a 0.4 gram Drennan Carp to fish two lines at 10 metres, one angled to the right with corn over micros and the other to the left with dead maggot over Special G Dark, I also had some Bait-Tech 4mm expanders for a change of hookbait. On the whistle I fed both lines before starting over the micros with a single grain of corn, I thought it might take a while to get bites but the Tart was into a carp quite quickly and so was the Hoff. After twenty minutes I hadn’t had a bite on corn so switched to double dead red maggot over the groundbait but by this stage my orange nemesis had already had two carp and I feared the writing was on the wall already. But then I had an indication before the float slid away and the strike resulted in a decent fish on, it wasn’t a carp but a skimmer of 12oz or so was very welcome all the same. 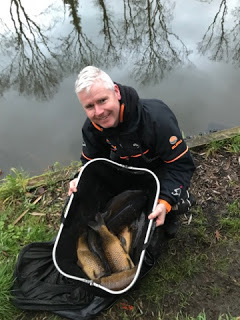 I had another skimmer, this one about 6oz and although I was a long way behind Brendon and Hoff who had both added skimmers to their carp, nobody else had caught much, Bushy and Butch over on peg 6 were catching roach and the odd small skimmer. I added a third hand sized skimmer before the end of the first hour, a quick try with dead maggot over the micros line resulted in a small roach back and then I had another over the groundbait, I put an expander on and missed a bite but I think it was roach and I wouldn’t be winning anything with those, especially as Yardie on peg 8 landed two carp in quick succession. Bish turned up for a walk around and it was nice to have a chat as I hadn’t seen him for ages, he soon got bored of watching me catch nowt and left me to it. 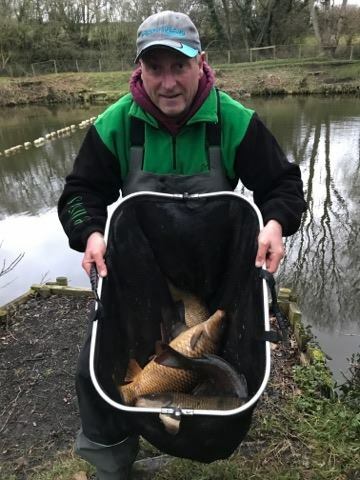 I tried maggot again and lost a skimmer before catching another around 6oz along with a couple of roach but I was going nowhere and when Yardie added a third carp and I heard Captain Smith up on peg 11 had a couple as well, I knew I needed to catch carp. I stuck with corn for the next couple of hours but never even had an indication and the Tart was still catching quite well and getting cockier by the minute. You could tell he was doing well because he kept saying Hoff had more than him to try and put us off the scent. With two hours to go, Bushy, me, Mark and Butch opposite still hadn’t hooked a carp so in a bid to try and make something happen I stuck on a couple more sections and fished towards the left hand rope with corn on the hook and just toss potting in a couple of grains with a few micros and I did have a couple of little knocks and missed a good bite but that was it. I tried scaling down to 0.10mm and a size 18 808 and even went to 14.5 metres towards the aerator but it was like the middle pegs were devoid of carp and I wasn’t too upset to hear the final whistle. I packed up and took my gear pack to the car before we congregated by the Tart’s peg and when I asked what weight he had, he was admitting to 32lb, he had ten carp and skimmer and his first net was more than his estimate, he ended up with 51lb so not too far out then! Butch had 3lb 6oz of skimmers and roach, Chris had 11lb 6oz and then Les had one carp for 4lb from peg 10. 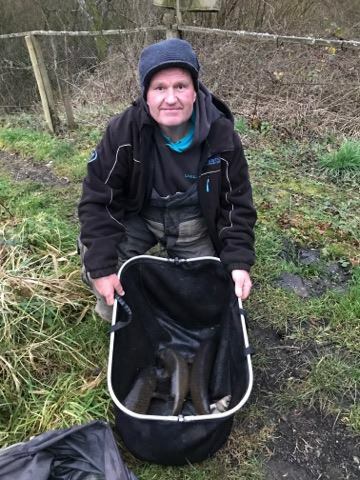 Smithy had caught a decent skimmer late which came in handy as he weighed 13lb 10oz to push Yardie down into fourth place. Mark had 3lb 10oz of silvers and then my four skimmers and three roach went 2lb 6oz and Bushy didn’t weigh, Hoffy on the other end peg had 29lb 10oz to take second spot. So the Grinch ruined Xmas by winning but then Santa Smithy restored my faith in humanity by handing out gifts in the shape of donuts and cookies, what a nice man, although I drew the line when he asked me to sit on his knee and tell him what I wanted for Xmas! The thought of Smithy in a red suit coming down my chimney with a bulging sack is quite frankly, the stuff of nightmares! Even though the Tart took my pound off me in the van sweep he had the audacity to claim I owed him a pound!, well I suppose it doesn’t happen very often so he has to make the most of it when it does. Previous: Previous post: The Perfect Seatbox?